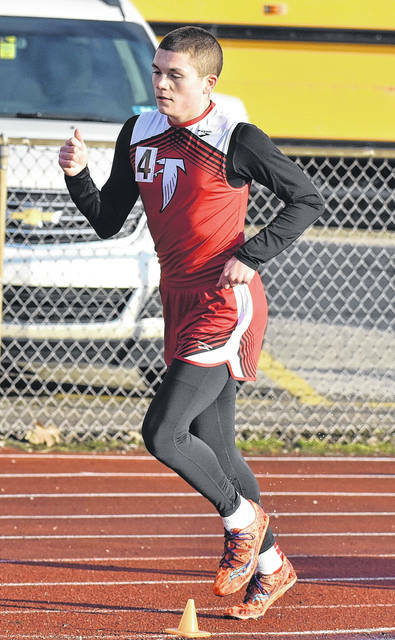 Wahama junior Jacob Lloyd hits stride during the 4x800m relay event on Friday, March 31, at the 2018 Herbert Hoover Invitational held at Laidley Field in Charleston, W.Va.
SPENCER, W.Va. — The Wahama boys placed fourth and the Lady Falcons were fifth overall at the 2018 Roane County track and field meet held Tuesday night on the campus of Roane County High School. Due to electrical problems, only 15 of the 18 total events were able to be completed — with the 3200m run, 4x400m relays and 4x110m shuttle hurdles relays being excluded from the competition. The White Falcons earned 11 top-six finishes and a half-dozen top-three efforts en route to a final team tally of 57 points. Roane County came away with the boys title with 109 points, while Clay County and Wirt County tied for second place with identical marks of 104.5 points. Johnnie Board was second in the pole vault with a cleared height of nine feet even, while Christopher Hesson was the shot put runner-up with a throw of 38 feet, 8 inches. The quartet of Zachary Roush, Trey Peters, Jacob Lloyd and Nathan Day placed second in the 4x800m relay with a time of 9:54.81. Brady Bumgarner was the 200m dash runner-up (25.17) and also placed third in the 100m dash (12.20) and fourth in the 400m dash (57.19). Bumgarner was also sixth in the long jump with a distance of 15 feet, 10½ inches. Brodee Howard was third in the 110m hurdles with a time of 17.23 seconds, while Lloyd was fourth in the 800m run with a mark of 2:26.92. Josh Frye was also fifth in both the 200m dash (27.63) and 400m dash (57.97) events. The Lady Falcons came away with a trio of top-three finishes and a total of seven top-six efforts, including a pair of runner-up performances, en route to a final total of 33 points. Roane County won the girls competition with 150 points, with Clay County (102) and Chapmanville (52) rounding out the top-three spots in the field. Kaleigh Stewart was second in the long jump (14-2) and also placed fourth in the 100m dash with a time of 14.92 seconds, while MacKenzie Barr was the pole vault runner-up (7-0). Barr also finished fifth in the 400m dash (1:15.89) and sixth in the 200m dash (32.09). Stewart, Barr, Skylar Riffle and Camryn Tyree combined to finish third in the 4x100m relay event with a time of 1:00.21. Tyree was also fourth in the long jump with a leap of 12 feet, 5 inches. Visit runwv.com for complete results from the 2018 Roane County Meet held Tuesday at Roane County High School.